We enjoy creating large bespoke storage and display units, tailored to a space and to a customer's requirements. We specialise in white hand-painted finishes but we are happy to work in other materials and styles, including solid oak, and ultra-modern high gloss sprayed doors. Custom designed hand painted shelving unit for a customer in Sheffield. 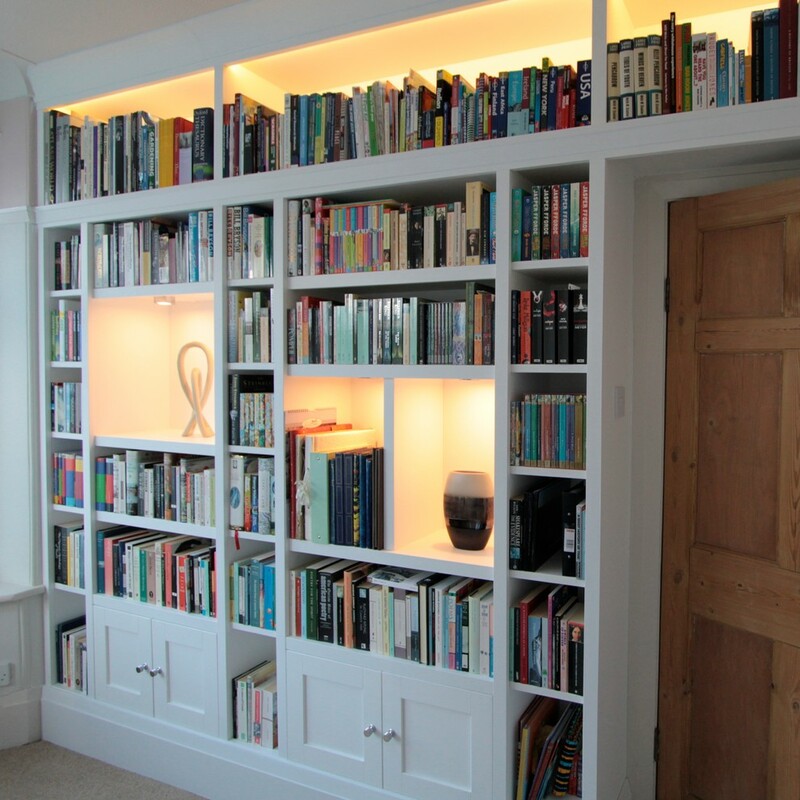 This unit replaced a messy set of mismatched Ikea bookcases and was designed to maximise book storage by going floor-to-ceiling and bridging over the doorway, while integrating display shelving with spotlighting and LED striplighting. A large run of white hand-painted fitted shelving incorporating a desk area, with high gloss sprayed olive-green cupboards below. A large custom designed fitted shelving unit spanning 2 walls and incorporating a desk space. The tall skirting boards of the original room were matched around the bottom of the unit. High gloss sprayed olive green doors were fitted on Blum push-to-open mechanisms in the lower cupboard spaces. Wall shelving and built-in cupboards in a family living room. Custom design bookshelves and media unit with matt grey touch-to-open door panels and curved doors. A simple well built full wall unit of shelving. 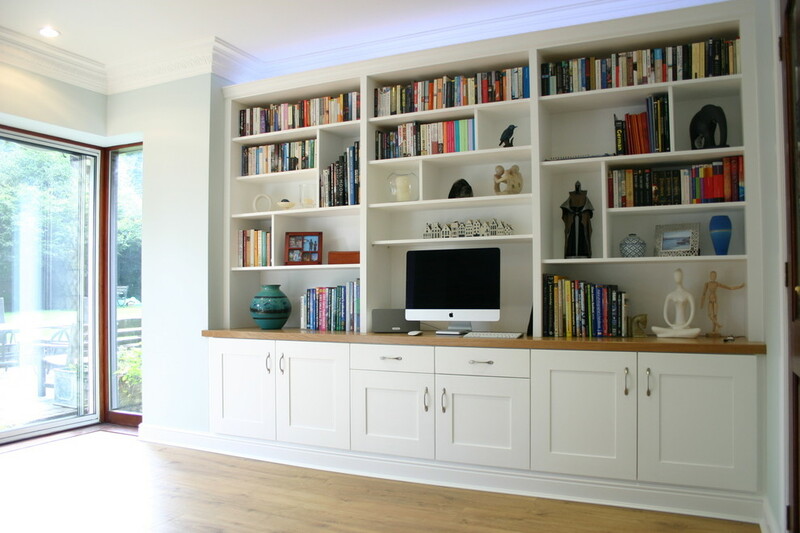 Bespoke built in library shelving fitted floor to ceiling and built around a doorway. Hand-painted in white eggshell, with skirting and coving matched up to the existing room. Custom designed bookshelves, cupboards and filing drawers for a home office in a large period house. Cream and oak effect finish. Custom designed filing drawers for a home office in a large period house. Cream and oak effect finish. QDS Carpentry. 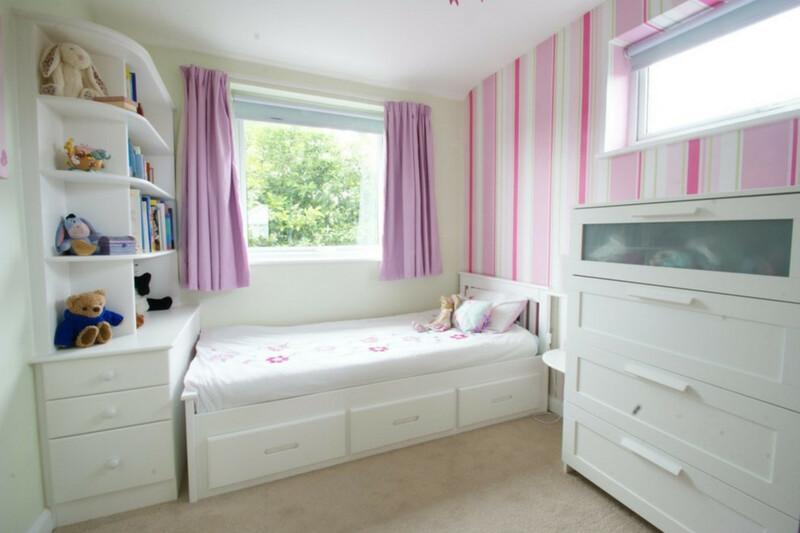 Custom designed shelving and drawer unit at the foot of a child's bed as part of a scheme incorporating furniture from Ikea and elsewhere. The shelves were given rounded edges and curved ends. All handmade and handpainted in white eggshell.